Real ale refers to beer that’s made the old-fashioned way. Real ale is brewed from traditional ingredients and is allowed to mature and age naturally. Maturing and aging naturally means the beer is unfiltered and unpasteurized, which means it still has live yeast in it and continues to condition and develop flavor and character even after it leaves the brewery. (When a beer is conditioning, it’s still fermenting a little bit, thus creating a gentle, natural carbonation within its container.) So, real ale is considered living ale. Real ale is always served without any extraneous carbon dioxide, nitrogen, or any other gas pushing it from its container — commonly referred to as head pressure. Real ale is traditionally pulled manually with a hand pump or by gravity dispense. Real ale that’s conditioned and served this way is also known as cask ale or cask beer. The terms cask ale or cask beer are used to differentiate from keg beer. Both cask beer and keg beer are brewed the exact same way — same ingredients, same processes. The only difference is how the beer is treated after primary fermentation is complete. Casks also have parts that are unlike those on a standard keg — and that are key to serving real ale. Casks have shives and keystones, and they’re meant to rest in a stillage. Shive: The shive, which is used like a stopper to close the hole in the cask, is found on the side of the cask at its widest circumference. The shive is where the landlord (a British term for pub owner) or cellarman (the person in charge of ensuring that the real ale is cared for in the cellar) places the soft spile, or peg, that allows the ale to breathe as it conditions. 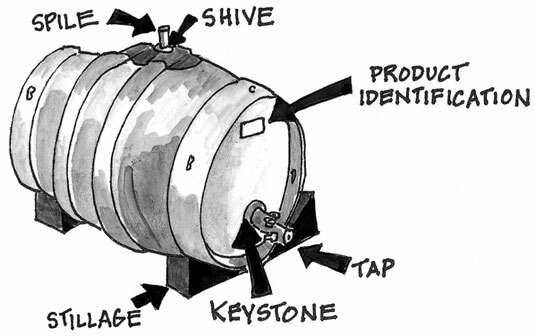 Keystone: The keystone, which closes a hole found on the head of the cask (one of the flat ends of the cask), is where the landlord or cellarman inserts the spigot (tap) or draught line if the cask is tapped via a beer engine. Stillage: The stillage is a cradle of sorts that holds the cask in place on its side while the beer is conditioning and being dispensed from it. A stillage may hold a single cask, or it may hold several casks, depending on its size. From a historical perspective, all vessels designed to hold large amounts of beer, wine, or distilled spirits were originally made of wood. Nowadays, these vessels can also be made out of stainless steel, aluminum, and even food-grade plastics. You can find casks (and kegs, for that matter) in all these types of materials, but stainless steel is the most common today. Despite their transition from wood to more modern materials, casks still go by nomenclature that’s both odd and interesting — and may even make you snicker. But understanding the different types of casks is really all about size and liquid volume. The table provides a list of various casks, their names, and their liquid volumes (note that according to tradition, these casks are listed in Imperial gallons; to convert Imperial gallons to standard U.S. gallons, multiply by 0.83257). The names for the barrels were believed to have been designated way back in the 15th century, and they’ve remained unchanged ever since. Because of the nature of real ale — poor stability, limited shelf life, and so on — most brewers prefer to package their beer in smaller vessels to help ensure product freshness. The smaller the vessel, the quicker its contents are emptied. Therefore, real ale is typically found only in pins, firkins, and kilderkins.